Massachusetts bed and breakfast inns bring the state's important history to life. The many small, charming inns that dot the Massachusetts countryside are reknowned for their hospitality and make a great base for exploring the many natural and manmade wonders of the state. From the rugged beauty of Cape Cod to the fall colors afire in the Berkshires, from the Revolutionary history of Boston to the Pilgrim's first landing point at Plymouth, Massachusetts has a lot to offer visitors. Below is a sampling of some of the state's best bed and breakfast inns. The Berkshires, a branch of the Appalachian Mountains located in western Massachusetts, are a popular getaway from the fast pace of the big cities. The area is known for its colorful fall foliage, its quiet rolling hills, and also as the home of the Norman Rockwell Museum and Tanglewood, the summer home of the Boston Symphony. Historic Merrell Inn - 1565 Pleasant St.; South Lee, MA 01260;(413) 243-1794;(800) 243-1794 - This 200-year-old former stagecoach inn is located just minutes away from Stockbridge, made famous by Norman Rockwell's paintings. The inn offers charming guest rooms, decorated in period furnishings, but all with private baths and air-conditioning. Some rooms even have wood-burning fireplaces. John Adams taught school there; Patrick Henry practiced his oratory skills there; and scores of early American settlers built a life there. Central Massachusetts is picturesque country with rolling hills and verdant fields. One of the most interesting sites in this area is Old Sturbridge Village, a living museum that shows visitors how early New England families lived. The Cora Needham House - 48 Main St.; Wales, MA 01081;(413) 245-7166 - Located near Old Sturbridge Village, this 18th century Federal-style inn is filled with local crafts and artwork. The guest rooms include white wicker furniture, cozy quilts, and lots of amenities. Public areas include a library, a modern kitchen with guest privileges, and a sweeping front porch with rocking chairs. Eastern Massachusetts encompasses a number of historic cities, including Lexington and Concord, the site of the first Revolutionary War battle, Salem, home of the infamous witch trials, and Plymouth, the first landing site of the Pilgrims. In addition, the booming metropolis of Boston with its neighbor Cambridge, delight visitors with arts, theater, history, and educational pursuits. Gordon 1814 House Bed and Breakfast - 15 Washington St.; Beverly, MA 01915;(978) 921-2612 - This Massachusetts bed and breakfast inn, located north of Boston near Salem, offers comfortable accommodations in a peaceful garden setting. This 19th century inn has large guest rooms, decorated with antiques and offering the latest technology, including high-speed Internet and CD and DVD players. Cape Cod, the easternmost part of Massachusetts, is known for its picturesque villages, its dramatic rugged coastline and quiet cove beaches, and its series of historic lighthouses. In the summer, the area is filled with tourists from all over the east coast. In the fall and winter, the area relaxes and shows its full seaside beauty. 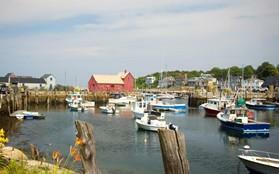 (508) 771-7213 - This fourteen-room Massachusetts bed and breakfast inn overlooks the sea. The clapboard inn is just a two-minute walk to the beach and offers antique luxury with modern conveniences, such as high-speed Internet access. The public areas include a spacious library and a garden gazebo.